These Amaretto tricolor cookies are also known as Neapolitan cookies, as well as Italian rainbow cookies. 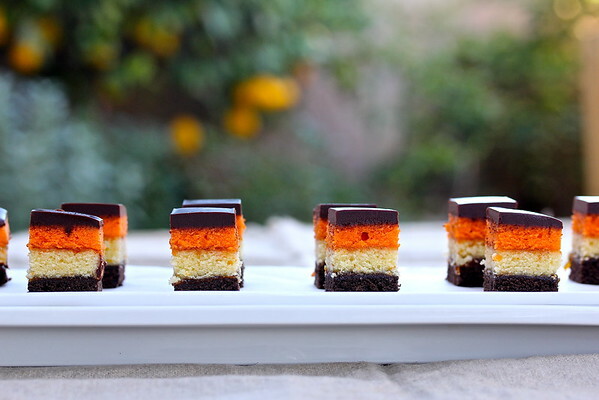 The layers are held together with Amaretto spiked apricot jam. Typically, they are made in the colors of the flag of Italy; red, white, and green; and they are an Italian American tradition. If you are ever at an Italian American party, wedding, or holiday celebration, you are likely to see these as part of the cookie platters. One of the primary ingredients for these cookies is almond paste. Did you know you can easily make your own almond paste? It is so much fresher than the packaged paste, and you can whip it up in about two minutes (I've included a recipe in case you'd like to try making your own). The cookies are faintly flavored with orange zest and are held together with an apricot jam and Amaretto mixture. The layers are all from the same batter, and then divided to add the colors. Each layer is baked in an 8 inch square cake pan and then stacked on top of each other. The whole thing is topped with a dark chocolate glaze, and then cut into squares. I used a large chef's knife to cut the squares, wiping it clean between each cut. Almonds, dark chocolate, citrus... practically health food, right? I love the combination of flavors. So Italian! Plus, making these will give you an excuse to buy a bottle of Amaretto! Speaking of booze, after the recipe, check out all of the links to cookies containing booze from my pals at the Creative Cookie Exchange. Add all of the ingredients to a food processor and pulse until it forms a paste. Wrap in plastic and refrigerate until needed. Butter three 8 inch square cake pans, line the bottoms with parchment, and butter the parchment. If you do not have three pans, you can bake the layers one or two at a time. In the bowl of a stand mixer, beat the almond paste, sugar, and almond extract with the paddle attachment until crumbly. Add the butter and beat at high speed until combined. Add the eggs, one at a time, until incorporated. Add the zest and stir until mixed in. Add the flour mixture, in thirds, mixing on low until just combined. Divide the batter into three bowls (I weighed the dough to make sure each layer had an equal amount). 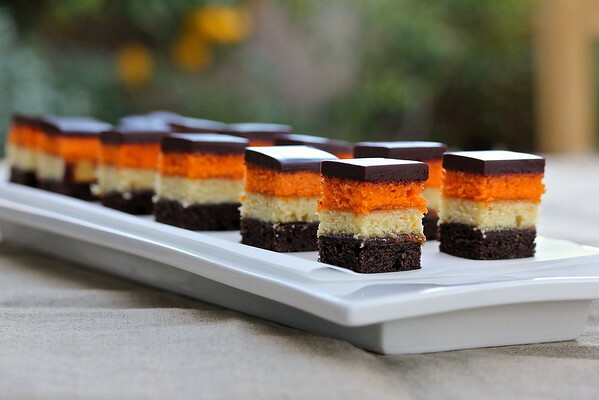 Mix the cocoa into one, the orange food coloring into one, and leave one plain. Spread the dough/batter into each cake pan, and smooth to create an even layer. Bake for about 12 to 15 minutes. Cool in the pans for 20 minutes, and then turn the layers out onto a wire rack. Remove the parchment. In a saucepan, mix the jam and the Amaretto and simmer for 3 to 5 minutes. If your jam is too lumpy, blend with a hand blender. Let cool for a few minutes before using. In a double boiler, or in a stainless bowl over a simmering pan of water, mix the chocolate, corn syrup, and butter. Place the chocolate layer in a parchment lined quarter sheet or jelly roll pan. Spread it with half of the filling. Place the white layer on top of the chocolate layer and spread with the rest of the filling. Place the orange layer on top and press the layers together gently with your hands. 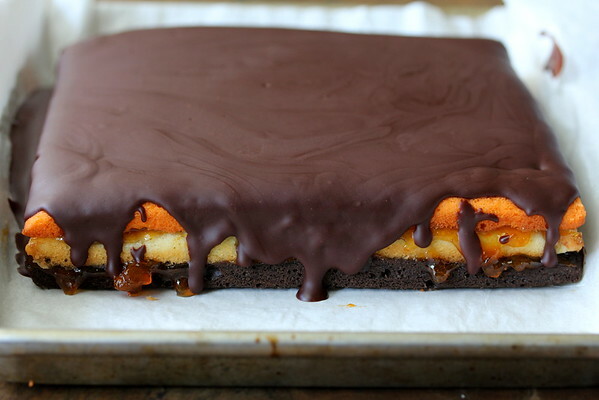 Refrigerate the layers for at least 5 minutes, while you make the chocolate glaze. Spread the glaze over the layers. Remove the pan from the refrigerator, and let sit for about 30 minutes. Lift the parchment onto a cutting board, and cut the layers into bars. I cut mine into generous one inch squares, which yielded 36 cookies. Store in a sealed container in the refrigerator for up to 4 days. Adapted from the amazing Baked: New Frontiers in Baking. They look so cool! Love those colors! Oh my those are gorgeous!! I love the colors too. They are just perfect, Karen! I am so impressed by how neat they turned out! Beautiful. The colors and the anticipated taste! Thank you for sharing! WOW, how pretty I just love these!! I LOVE these! Honestly I like them better than the red/green ones. And wow such nice slices and gorgeous photos. You seriously must have awesome hands. Awww. You are way too "awesome!" Oh wow! These are beauties! I am so impressed! Exquisite! They are s gorgeous. I have no other words, Karen! 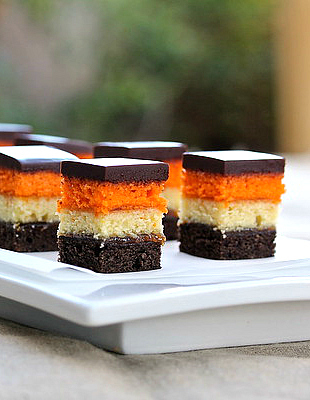 Almond... orange... chocolate - I am officially in heaven! These are very pretty. I had no idea almond paste was so easy to make, I will have to try making it! Ok, you OUTDID yourself this time... I knew you are a fantastic bread baker, but now I also know you could open your own patisserie and make good money out of it. These are gorgeous and so festive. I have to try that almond paste recipe! Your cookies are so very pretty, I bet they taste fabulous also. Ohh! I just tried these for the first time over Christmas. My friend from culinary school made them at home and brought them in for us as a treat. So delicious! I love that you decided to do a chocolate cake layer. YUM. Thank you so much for linking up to Tipsy Tuesday! Perfectly cut Karen, they look amazing! Love how fancy these are!